Caminalda - Friend or Culprit? 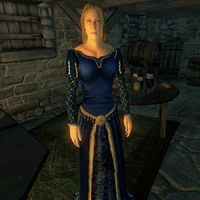 Caminalda is an Altmer mage who is a regular at the Brina Cross Inn. She plays a major part in the Anvil Recommendation quest. She carries a key that opens the middle door of the upper hallway of the Brina Cross Inn and a chest within containing some gold. She wears a pair of blue suede shoes and a matching blue velvet outfit. She also carries three strong potions of healing, two strong potions of sorcery, and a leveled amount of gold. She carries no weapons and relies instead on a leveled frost damage spell as well as a leveled set of battlemage spells from every magic school except Illusion. At the Inn, she does nothing but wander around and chat with the other guest Arielle Jurard and the innkeeper Christophe Marane. 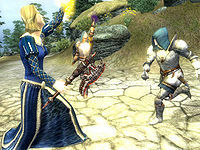 When the quest is initiated, the undercover Mage Arielle Jurard will task you, "Go and speak with Christophe. Rent a room for the night. Once you have your room, I will meet you there. If anyone asks, you are a traveling merchant, nothing more." Regardless of your reply to Christophe, Caminalda will then seek you out and ask, "Pardon me, but did I hear you say that you're a traveling merchant?" If you say no, she will excuse herself with, "Oh, I'm sorry. Perhaps I heard incorrectly. Excuse me." If you lie and say you are a merchant, she will be almost unbearably nervous on your behalf: "Don't you worry, what with the recent killings and all? I'd be ever so scared, if it were me. I haven't left the Inn in days, just in case! Well, you take care of yourself. I'd hate to hear about another senseless death. Good luck to you!" When approached again, she will quickly end conversation with, "Oh, don't let me bother you. You just stay safe on the road." When you wake up the next morning, Caminalda will be gone from the taproom and Arielle Jerard and another battlemage, Roliand Hanus, will be waiting outside the inn. When you travel down the Gold Road as instructed, Caminalda, now a member of the Necromancers Cult, will come rushing out of the wilderness and immediately confront you, saying, "I'm afraid your journey ends here, traveler. I'll be taking whatever you're carrying. After you're dead, of course. I do hope it's more than the last few had. They were most disappointing." She will then attack you with her entire arsenal of spells, and you will have to kill her, with the help from the two battlemages. Another unused line suggests that Caminalda was supposed to act innocent when spoken to: "Ah! How brave of you, to walk the roads with all of the recent trouble! I myself have been here for some time, hoping to find out what's going on. No luck yet, though. Well, you watch out for yourself, and be careful!"